Through His death and resurrection, Christ “nullified death.” (2 Tim. 1:10). 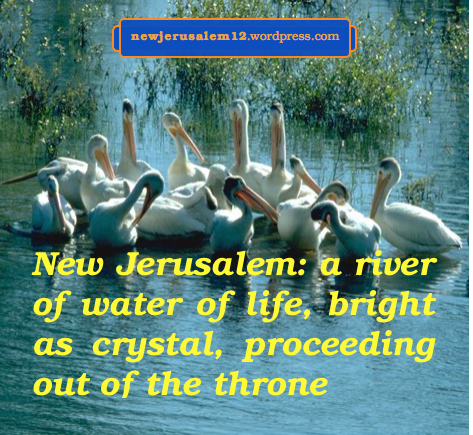 In the recent years I have written about New Jerusalem as the consummation of many spiritual matters throughout the Bible. These topics include the garden of Eden, water of life, oneness, holiness, shadows of New Jerusalem in Psalms, living in versus living around New Jerusalem, mercy, living stones, unsearchable riches of Christ, maturing in Christian life, and more. Revelation 21 begins “And” to link the appearance of the new heaven and new earth with the termination of the devil, death, and Hades. The old creation was old because of rebellion against God. The new creation is new because of God’s renewing work and the elimination of rebellion and the devil, the source of rebellion. The sea is the result of God’s past judgments. Since in Revelation 20 all judged things were cast into the lake of fire, this lake has replaced the sea and there is no more need of the sea. See also New Heaven, Earth, Jerusalem; No Sea. 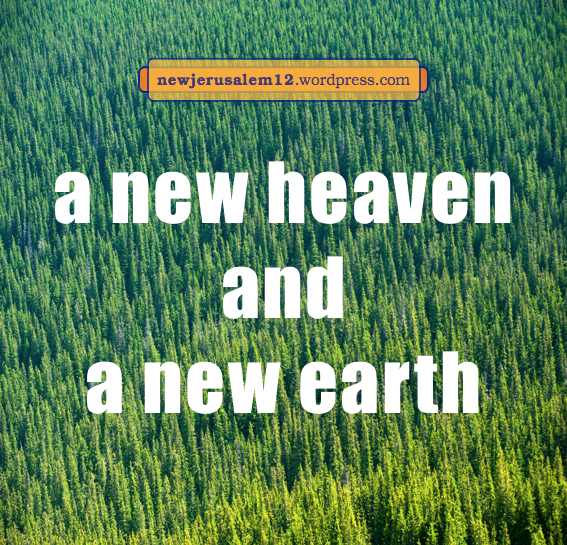 This change in the creation opens the door for New Jerusalem to come down out of the new heaven to settle on the new earth. The Gospels and Acts describe many miracles. These miracles included healing of sick and crippled people, cleansing of lepers, raising the dead, and casting out demons. All of these problems are due to Satan’s rebellion, man’s fall into sin and death, and God’s curse on the fallen creation. These problem sources will not be in New Jerusalem. Hence there will be no problems and no need of miracles to remove problems. “The devil was cast into the lake of fire and brimstone” (Rev. 20:10). “Death and Hades were cast into the lake of fire” (20:14). “There will no longer be a curse” (22:3). The sources that brought forth problems in the old creation will have been eliminated. • no demons, hence no need to cast them out. Several times the Lord Jesus rebuked cities for not repenting. Luke 10:13 is an example, “if the works of power which took place in you had taken place in Tyre and Sidon, they would have repented long ago.” In New Jerusalem we are outside of anything which requires repentance, so there is no need for works of power to motivate repentance. Miraculous actions will not be in New Jerusalem but today they are some help to bring people onto the path to New Jerusalem. 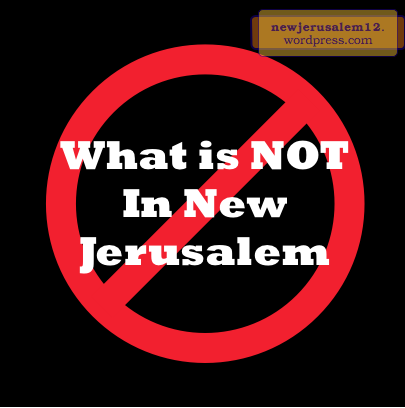 More about What is NOT in New Jerusalem. At the Lord’s second coming He will redeem our mortal, corrupted body, transfiguring it to be like His body of glory (Phil. 3:21). This is a step on our path to the city of glory, New Jerusalem. We are in the third verse of a hymn about the redemp-tion of our body when the Lord returns. Again the song begins with Christ as our hope of glory. Then Christ is our full redemption. He has already completed redemption for forgiveness of sins, but we are still awaiting the redemption of our body. 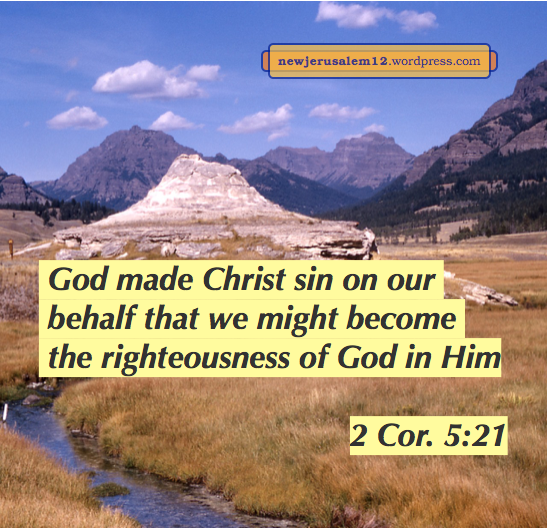 This step of redemption will set our fleshy body free from sin and death. These two negatives always go together and are in our body. Romans 7 says that sin dwells in us, and causes us to do what we do not want to do. It also speaks of “the body of this death”—the death brought in by sin. And Romans 8 clearly states “the body is dead because of sin.” “The redemption of our body” (Rom. 8:23) will free us from both sin and death. This stage of redemption will fill our body with resurrection life and bring forth the Lord’s glory through our body. This is a big step toward New Jerusalem. First Corinthians 15:54 has all these points and is the basis for the last line in the song. “When this corruptible will put on incorruption and this mortal will put on immortality, then the word which is written will come to pass, Death has been swallowed up unto victory.” New Jerusalem will be incorruption, immortality, and victory! 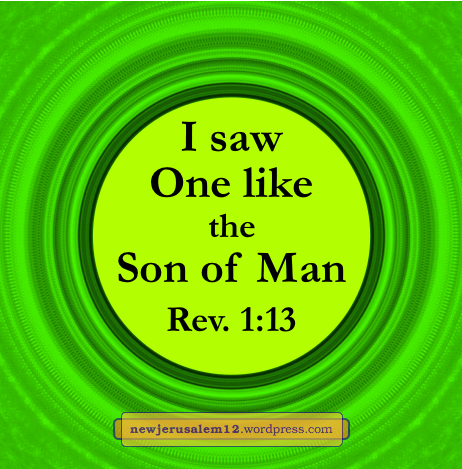 Jesus Christ is the real Husband in the universe and New Jerusalem is the wife. This likeness is in Ephesians 5:23, “a husband is head of the wife as also Christ is Head of the church.” Jesus described Himself as the real Bridegroom in parables in Matthew 9:14-17 and 25:1-13. And John the Baptist referred to Him s the Bridegroom in John 3:29. On one hand, we are responsible to prepare ourselves for the wedding day. An example is our need to have much oil in our lamps, signifying the Spirit filling our being, as in Matthew 25. On the other hand, Jesus Christ prepares us first by His redemption and now by His life in us. Both are presented in Ephesians 5:25-27. Revelation 21:4 says, “He will wipe away every tear from their eyes; and death will be no more, nor will there be sorrow or crying or pain anymore; for the former things have passed away.” The wiping of tears, and the absence of sorrow, crying, and pain correspond to the Lamb’s care in Revelation 7. Death will be no more because of “our Savior Christ Jesus, who nullified death and brought life and incorruption to light through the gospel” (2 Tim. 1:10). The words He speaks are faithful and true because He Himself is Faithful and True (Rev. 3:14, 19:11). These few verses show that so many characteristics of Jesus Christ today match what He is in New Jerusalem, and are our path from today unto New Jerusalem. Revelation 19 concludes with the victory of the Lamb and the army with Him (v. 19-21). The beast and the false prophet are cast into the lake of fire and their followers are killed by the sharp sword out of the mouth of Him who is the Word of God. The same Word both nourishes us and slays God’s enemies. How marvelous. Revelation 20 begins with the devil, Satan, being cast into and locked in the abyss (v. 1-3). Thus the whole earth is cleaned up by Jesus Christ, the One on the white horse, He who is Faithful and True, the Word of God, the King of Kings. Praise Him! With this cleansing the millennial kingdom comes to the whole earth and New Jerusalem follows. 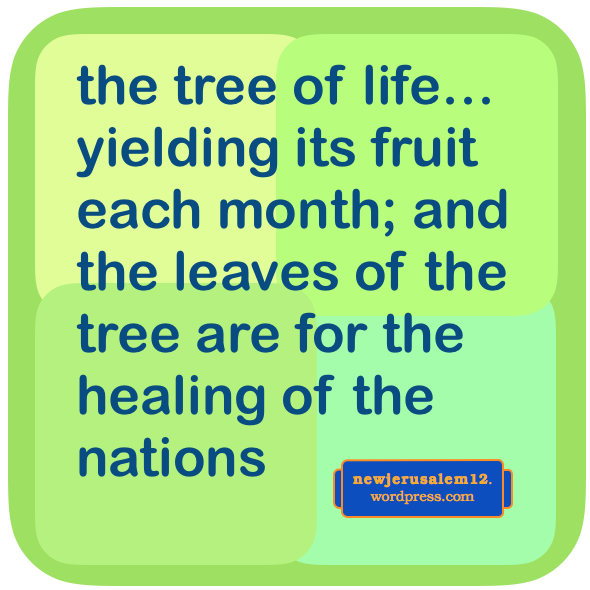 The characteristics of the millennium in this verse have many parallels with New Jerusalem. “Blessed and holy”—The Triune God is Our Blessing in Revelation 22:3-5, and we will all be holy to match the holy nature of that city. 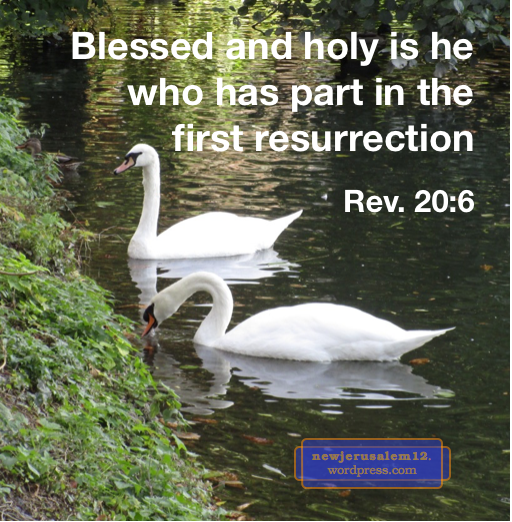 The partakers of the blessing are in resurrection here, and New Jerusalem is A City in Resurrection. 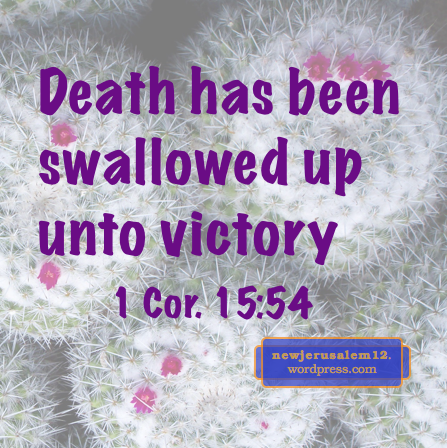 Death has no power here and there will be Neither Sin nor Death in New Jerusalem. Here the partakers are priests and reign with God and Christ. 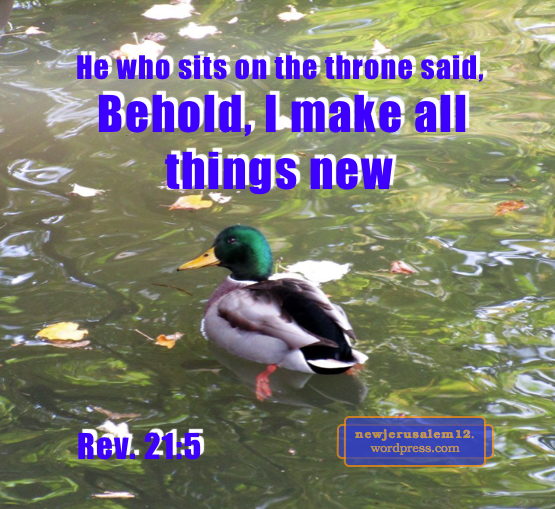 In New Jerusalem we will continue as Priests and Kings in God’s Plan. All of these blessings come from God through Jesus Christ. Praise Him! 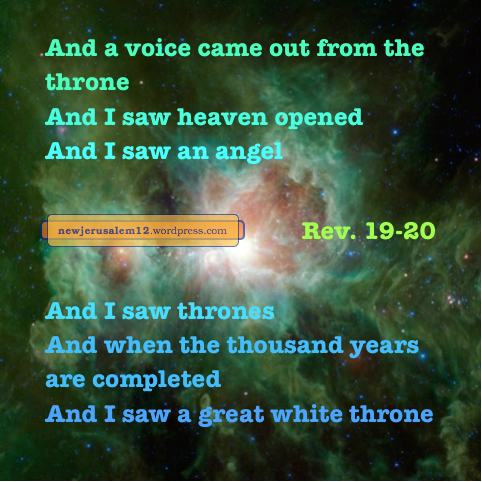 The blessings in Revelation 20 are for a thousand years and the richer blessings in New Jerusalem are for eternity.